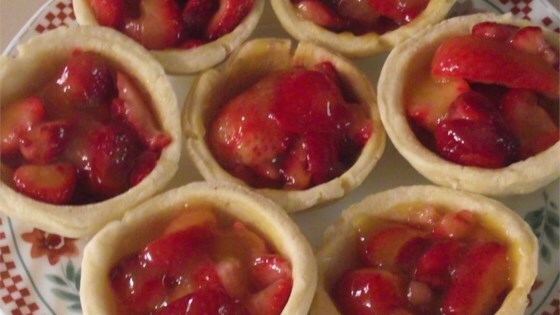 "One woman I worked with loved these tarts and would bring some in to work with her. They were so good. These are extra-delicious when topped with whipped cream." Very tasty. One piece of advice: Do NOT take these tarts to a picnic! The glaze gets runny very fast in warm weather. I used piecrust for the tart cups and that seemed to work just as well. Very good. I loved this recipe! However, I found it difficult to find prepared tart shells, so I had to bake my own. The glaze was incredible and the strawberries were the perfect compliment! This was very good! There was way too much glaze, and I ended up throwing a lot of it away. Next time I will make 1/2 the amount of glaze. Great flavor! This is soooo good!! I made it for a huge family picnic and it was such a hit! Very easy to make. My husband is begging for me to make some more already!